Creating a Twisted Nine Patch Quilt is a great way to use up those left over 3 1/2 inch strips or cut up some of those older fabrics in your stash. 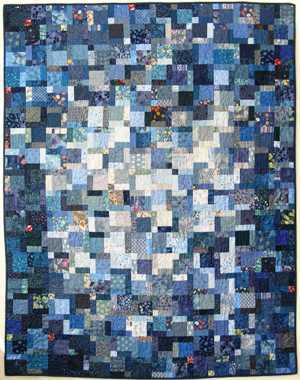 This amazingly quick and easy scrap quilt looks fabulous! 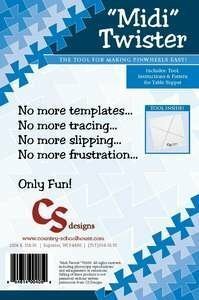 If you want to keep it from looking too "busy", use scraps from one colour way only. 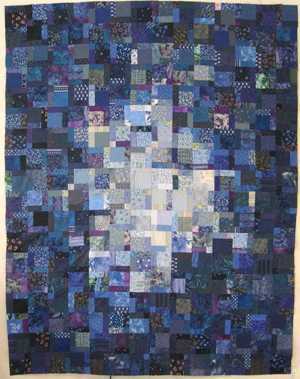 In the sample shown, I have used all blue scraps, even though my blues tend to get a little purple and some a little green -- it is ok to borrow from the neighbours, even those on the color wheel! 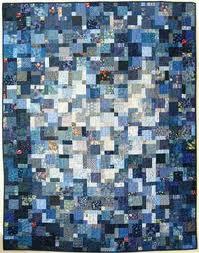 I've also used blues with other colors in, like stripes and florals -- as long as it has blue in it, it is a blue! In my six hour class you can get a lot of blocks made. 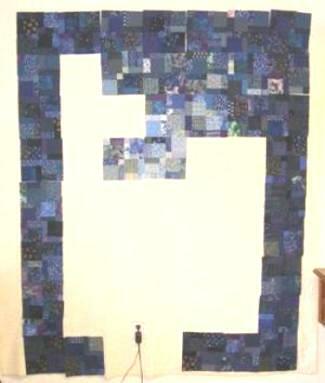 Strip piecing makes it go together quickly, and then you start playing with blocks on the design wall. Once you are happy with the layout, sew the rows together. If you or your group wish to take this class during a retreat Contact Me for more infomation or reservations. Finished with "Twisted Nine Patch Quilt?" Return to "Classes I Teach"